If the pavements are slippery during the festive season, it is reflected in a peak in pedestrians falling accidents and people hurting themselves. In the beginning of winter, pedestrians have forgotten to adapt their gait to slippery conditions, which is why the ‘Pysy pystyssä’ anti-slipping campaign raises awareness among citizens. The festive season has started, and it can be seen in the number of slipping accidents. Slippery conditions alone will increase the risk of falling down, but the festive season with all the pre-Christmas parties combined with slippery conditions make for a highly elevated risk. “The festive season means more parties, which in turn increases the risk of falling over due to alcohol consumption. On the weekends, more than half of the patients that suffer from fractures of the ankle or leg have been under the influence of alcohol at the time of being injured,” says Lauri Handolin, head of department at Töölö Hospital. 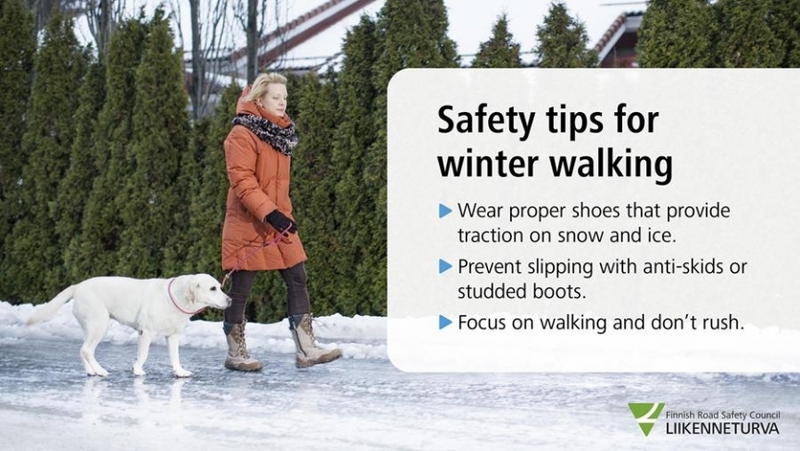 You should be aware of possibly slippery conditions and choose appropriate footwear before you go out. Once on the move, it is crucial to focus on your walking. “You rarely slip in the ice rink, because you are aware of the slippery conditions when walking on ice. When you remember to stay alert when walking down the street, you are more likely to remain upright. Alcohol is a special concern during the festive period – remember to drink in moderation,” Handolin continues. The ‘Pysy pystyssä’ anti-slipping campaign, to be launched in full force in January, encourages pedestrians to anticipate slippery conditions well in advance. “You should check the weather warnings for pedestrians before you go outside. You should also try to avoid leaving in a rush, as you are more likely to slip and fall if you are in a hurry. You also shouldn’t be looking at your phone while walking, because not paying attention increases the risk of slipping. Focus on walking,” says Kaarina Tamminiemi from the ‘Pysy pystyssä’ campaign. The thermometer alone will not tell you whether it is slippery outside or not. People can now report their observations of slippery conditions using the Weather application created by the Finnish Meteorological Institute. “We are particularly looking for information on situations where large street areas are very slippery, making it difficult to walk normally. The observations are monitored by our Weather and Safety Center. You should remember to stop to send your observations to avoid slipping while tapping on your phone,” says senior meteorologist Sari Hartonen at the Finnish Meteorological Institute. The ‘Pysy pystyssä’ campaign promotes pedestrian safety in the winter. The campaign launches in January on the radio and in social media. Follow: #pysypystyssä and @kotitapaturma. Aivovammaliitto, EHYT Finnish Association for Substance Abuse Prevention, Finance Finland, City of Helsinki, Finnish Meteorological Institute, Finnish Association of People with Physical Disabilities, Finnish Road Safety Council, LähiTapiola, National Defence Training Association of Finland (MPK), Nikander ja Wiinikka Oy, Partioaitta, Sarva studded shoes, Finnish Ministry of the Interior, Ministry of Social Affairs and Health, Association of Finnish Local and Regional Authorities, Finnish National Rescue Association, Finnish Red Cross, SOSTE Finnish Federation for Social Affairs and Health, Finnish Swimming Teaching and Lifesaving Federation, Taitavat Suutarit ry, National Institute for Health and Welfare, Finnish Safety and Chemicals Agency (Tukes) and Finnish Institute of Occupational Health. The Funding Centre for Social Welfare and Health Organisations (STEA) also supports the campaign.